Waunakee's Taiten Manriquez throws during the Division 1 state semifinals last year in Grand Chute. The 2019 WIAA spring baseball season is underway. These are our first power rankings of the season. The top 15 is ranked regardless of Division. The top five for each Division can be found at the bottom of the page. Eau Claire Memorial (3-0), Eau Claire North (4-1), Franklin (4-0), Greendale (4-1), Holmen (3-1), Muskego (2-1), Prairie du Chien (5-0), South Milwaukee (4-1), Webster (2-0), West Bend East (5-0), Wisconsin Lutheran (5-0). The Crusaders dealt No. 9 Arrowhead a loss early in the season, but enter this week with a 3-2 record. They’ve also beaten Milwaukee Lutheran, and Alex Cyskiewicz hit a walk-off single against Brookfield East. They dropped games against Arrowhead and Nicolet. Games against Milwaukee Reagan, Waukesha North and New Berlin Eisenhower are on tap this week. The Panthers split their first two games of the year in a doubleheader against De Pere this weekend. JD Schultz tallied three hits in SPASH’s first game, and pitched six innings with seven strikeouts in game two, where he had a no-decision. Brett Ehr and Jack Kelly both knocked four hits over the course of the day. The Panthers have two games against Marshfield and one against Mosinee this week. The Polar Bears have won three in a row after dropping their season opener against No. 12 West De Pere. In that win streak featuring victories over Hartford, Neenah and Fond du Lac, the pitching has held opponents to four total runs. Games against Appleton East, Appleton North and Westosha Central are on the schedule this week. The Phantoms have won their first two games of the season, largely thanks to their outstanding pitching. Lefty Ben Hampton struck out 11 hitters in 5.2 innings against No. 13 Hortonville, and Connor Langreder punched out seven in five innings against New London. Reigning Newcomer of the Year Cameron Dupont has four hits this year – three of which are doubles. Games against Seymour, Xavier, Fox Valley Lutheran and Fond du Lac await this week. The defending Division 2 state champions have not lost this year, carrying a 5-0 record into this week. Keegan Hartgerink has won two games for the Warriors in walk-off fashion. He hit a walk-off homer in the season opener against St. Mary’s Springs, and a walk-off sacrifice fly against Lake Mills this week. Caden Bronkhorst has been as good as expected, not allowing a run through 11.2 innings on the mound so far. The Spartans have won four of their first five games of the year, with the only loss coming when they split a doubleheader with Oshkosh North on Saturday. Gavin Hinckley is red-hot to start the season, with a .583 batting average and 10 RBIs through the team’s first five contests. Logan Broske has seven hits in four games. This week has West scheduled for two games against Nicolet and one against Milwaukee King. The Warhawks, last year’s Division 1 runner-up, have started the season 4-1. They dropped the season opener to Catholic Memorial, but bounced back with a win over the Crusaders two days later and haven’t lost since. Nic Wohlfiel has a hot bat to start the year, hitting .583 with two homers and nine RBIs so far. Arrowhead has two games this week against Muskego, an honorable mention in the rankings. The Demons are in a unique situation to start the season. They’ve pitched no-hitters in both of their two games this year, but they only won one of them. Trent Turzenski and Colin Degroot combined to no-hit No. 7 Kenosha Indian Trail in the season opener, but the Hawks scored three runs in the bottom of the seventh off walks, errors and hit batsmen to grab a walk-off win. The very next day, Trey Krause spun a five-inning no-hitter against Delavan-Darien, striking out 10 in the process. Burlington will try to keep the pitching momentum going with two games against Badger and one against Delavan-Darien this week. The Hawks have been the breakthrough team of the season through its first two weeks. They’re 4-1 to start the year, with wins over No. 8 Burlington and preseason ranked Kenosha Tremper to its name. The team’s pitching has been strong, holding opponents to an average of three runs per game. They’ve got three games against Racine Park this week. The Red Devils haven’t lost this season, sitting at 3-0 thus far. All of their wins have been blowouts, with every win coming via the 10-run rule. Look out for Spencer Lehmann: He’s hitting .666 with seven RBIs to start the year. Bradford will be involved in three ranked clashes this week, with a series against No. 5 Oak Creek on tap. The Knights are unbeaten at 4-0, having swept a three-game series against Racine Case and winning a nonconference bout with Brookfield East. Colin Kalinowski is swinging a powerful bat so far, with a .500 batting average and four doubles already. This should be an interesting week in the Southeast Conference: the fifth-ranked Knights play sixth-ranked Kenosha Bradford three times. The Papermakers are 3-1 to start the year, with their only loss coming in a doubleheader split with Sun Prairie. They scored 34 runs across their first two games of the season, beating Kaukauna 14-5 and Oshkosh West 20-0. Connor Chitko tallied four hits in Saturday’s doubleheader against Sun Prairie. Kimberly has games against Neenah and Fond du Lac this week. The Hornets have won their first two games of the season, beating Pulaski and Marquette. 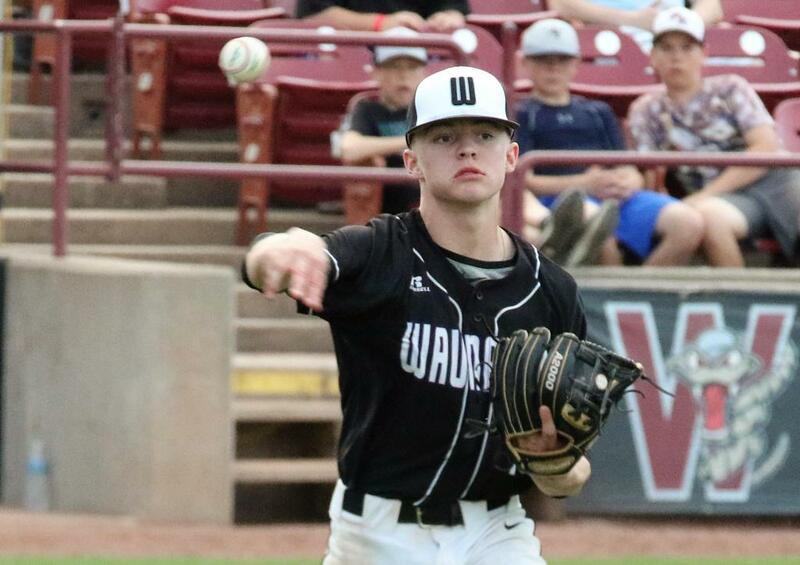 Clemson recruit Max Wagner is off to a good start: he pitched 6.2 scoreless innings against Pulaski and knocked two hits against Marquette. Josh Nicklaus has four hits in his first six at-bats of the season, including a double. Games against Manitowoc Lincoln, Sheboygan South, Green Bay Southwest and Antigo are on the schedule this week. The Cougars have been completely unchallenged in their first four games of the season, with an average margin of victory of 11.5 runs. They’ve scored at least 10 runs in every game this year, with a season-best 17 against Beloit Memorial last Tuesday. Eric Hughes went 5 for 9 at the plate last week. Up next is a pair of games against rival Janesville Parker this week, and a game against Verona on Saturday. The defending Division 1 state champs are off to a 5-0 start to the season, highlighted by a walk-off win over Sun Prairie in the season opener. Reigning state player of the year Nate Stevens has already homered twice this season as part of an offense that is averaging nine runs per game. Nick Smith is hitting .462 through the team’s first five games. The lineup will try to keep the firepower going in two games against DeForest this week.